What does an improperly placed monitor point do to a signal? I have 47 E1s? How much hardware do I need to monitor them? How does TCP behave on an interrupted network? Replaying a bit-exact recording of an E1 timeslot. Reading SS7 packets from a .pcap file, re-create layer 2. Creating SS7 packets from scratch. This post is about the second approach. It's particularly useful because we can use this technique to convert a SIGTRAN capture into an SS7 capture with MTP-3 and MTP-2. It's also satisfying because we can take packets full circle---we can play the packets from a PCap file and make a new PCap file with the same packets after they've passed through an E1 line. It assumes you have an E1 cable between P5 and P6, as illustrated in the previous post on this subject. 1. The 'replay_mtp2' program reads SS7 packets from a PCap file. 2. The Corelatus box does bit-stuffing and inserts flags and FISUs. 3. After the signal goes out through an E1 cable and back in again, the Corelatus box recovers the SS7 packets. 4. 'save_to_pcap' saves the packets in PCapNG format. 5. 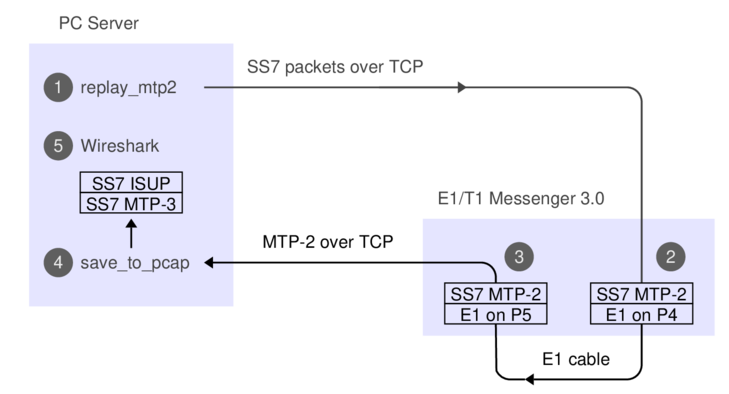 Wireshark decodes MTP-3 and higher SS7 layers to display the packets. We can view both files in Wireshark and compare them. They'll contain the same packets, but with different relative timing, since 'replay_mtp2' just replays the packets as fast as possible. Wireshark has a collection of SS7 capture files, with all sorts of contents. They're all in the old 'classic' PCap format, so we have to convert them. packet bytes replayed: 158. Sleeping to drain buffers. If you look at the output file more closely, you can see that the MTP-2 fields are faked; the sequence numbers don't increment. That's because the original data didn't have any sequence numbers in it. If we wanted to, we could extend 'replay_ss7' to generate realistic sequence numbers. packet bytes replayed: 559. Sleeping to drain buffers. I didn't bother with a few of the sample captures in the Wireshark wiki. 'bicc.cap' only contains one packet and it's not SS7. 'packlog-example.cap' contains a hex dump of a few packets, in a pinch we could convert it with 'text2pcap'.